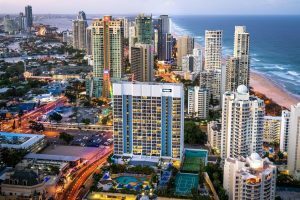 Mantra has launched a new Mystery Hotel deals offering for Surfers Paradise accommodation, providing guests the opportunity to bag a bargain by booking at an unnamed Mantra hotel or resort. On the Mantra website, only the barest of property details are displayed but guests can be assured they’re getting a fantastic room in a location close to the beach that comes with a level of amenities and service you would expect from the leading hotel and resort operator based in Australia. There’s even a selection of room types to choose from including hotel rooms and spacious one, two and three bedroom self-contained apartments. Guests can see bedding configuration options and the key facilities the hotel has… and the name and address of the hotel will be revealed within 24 hours of booking. Stay in a Hotel Room from just $99* per night, a One Bedroom Apartment from $119* per night (minimum three night stay – total cost $357*), a Two Bedroom Apartment from $169* per night (minimum three night stay – total cost $507*), or a Three Bedroom Apartment from $199* per night (minimum three night stay – total cost $597*). To book a Mantra Mystery Hotel deal, visit www.mantra.com.au/mystery-hotel (available online only). *Conditions apply, subject to availability. A weekend surcharge may apply. Full payment is required at the time of booking. All bookings are non-refundable. A 100% cancellation fee applies to no-shows and cancellations.